Team Fractal Alligator is, ironically, not a team at all and consists of just one developer from Adelaide, Australia: Matt Trobbiani. He apparently started out developing games using tools like GameMaker and also creating custom maps for Warcraft 3 before learning C# and developing custom engines. 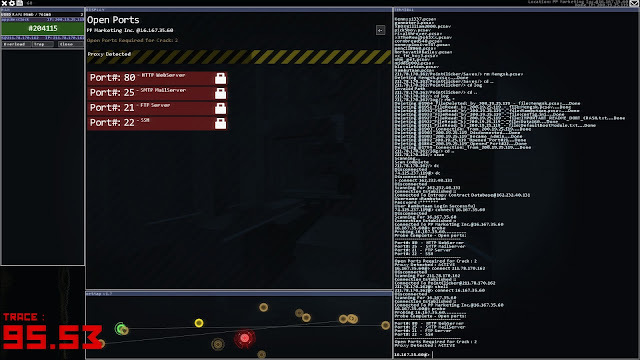 Trobbiani posted an unfinished version of Hacknet to the website IndieDB in 2012 and it gained a lot of interest. After borrowing $10,000 AUD to finish the game he finally released it on Steam in 2015. 100,000 copies of the game were sold in the first four months meaning not only did Trobbiani recoup his costs, he also made a tidy profit. 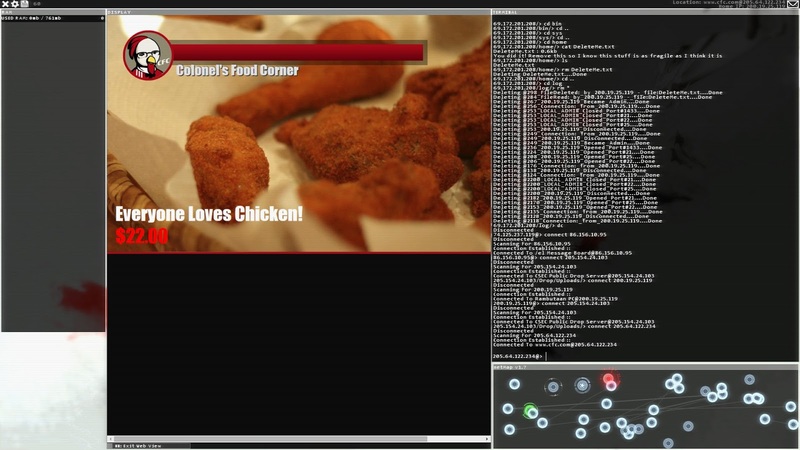 Hacknet is a terminal-based hacking simulation game where you use UNIX-like commands in order to gain access to other computers. You receive instructions from a deceased hacker going by the handle "Bit" and it's up to you to discover what happened to him and to fulfil his final request. Along the way, you'll be granted missions from various hacker groups; completing missions will eventually grant you access to more powerful tools so you can take on even more secure nodes. Hacknet – Complete Edition includes the original game Hacknet as well as its expansion Hacknet - Labyrinths which was released on the 31st March 2017. Hacknet – Labyrinths seamlessly fits into the base game as a kind of alternate network that you can access from the base game. I received a copy of Hacknet from Choicest Games contributor Choona back in August 2015 (thanks Choona) but it wasn't until October 2017 that I got its expansion, Hacknet – Labyrinths via the "Humble Down Under Bundle". Maybe it's my programming background but I've somehow always been intrigued by games, movies and books that involve hacking which is why I wishlisted Hacknet. What really impressed me about this game is how immersive it is; it goes to great efforts to blur the lines between reality and the virtual world the game is set in. 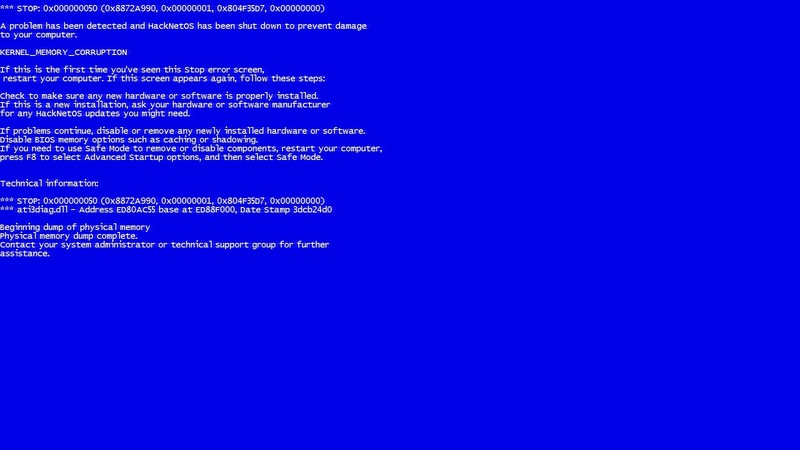 For example, any time your terminal is traced or hacked, it results in a Blue Screen of Death (BSOD), although only if you look closely will you realise it's fake, not to mention Windows 10 tends to have different looking BSODs nowadays. 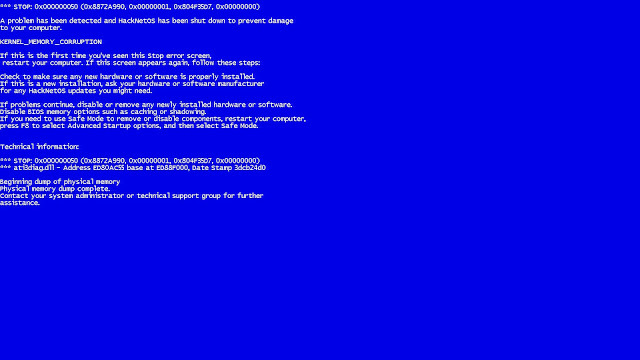 In one particular mission where you get the BSOD, you're locked out of your in-game GUI and you've got to use the in-game command prompt mode to download the correct system file in order to reboot it again. And speaking of command prompts, this is taken one step further on a Hacknet – Labyrinths mission where the game itself closes down and you have to use your actual command prompt (good ol' cmd.exe on Windows) in order to navigate your actual PC's folder structure to delete a fake .dll file planted there, following instructions given by a game character in a .txt file! I do love the developer humour in this game, such as reading about some guy who now feels smart because he found some "regex on Stack Exchange": there's only 10 types of people in the world and only one of those groups will get it. Deus Ex did this really well, where you're able to piece the lore of the game by reading notes: it is the same for Hacknet, and you do so by reading IRC logs, txt files and emails. I believe Hacknet – Labyrinths starts when you complete these trials called "the Kaguya Trials"; successfully completing these trials means you get to work with three 1337 h4x0|25. The expansion is everything good about Hacknet but better: there's even more interesting missions to do, a bunch of new, interesting tools (like tunnelling using the SSLTrojan tool) and there's even a sense of camaraderie thanks to the developers conversing with each other in a chat room (even if it's all staged and not interactive). The game starts off with rather harmless and mischievous missions (like defacing fast food websites) but moves on to ones that are literally life or death situations, such as determining whether a plane should crash or whether a patient's wish to be euthanised should be fulfilled. I love games with ethical dilemmas and Hacknet doesn't disappoint. Both the Hacknet and Hacknet – Labyrinths soundtracks are chock-full of exceptional synthwave, French House and Big Beat style tracks from some pretty big names in the genre too such as Carpenter Brut. While the hacking in the game is somewhat simplified compared to real-life, it still follows the basic concepts and is probably as close as you're going to get without actually doing the real thing. Hey, at least it's not like this hacking scene with Hugh Jackman in an old movie called "Swordfish". In fact, the developers are confident that school students would be able to learn a bit about hacking by simply playing this game, which is why they've made the game available under an educational license. There's probably only a handful of games out there where having experience typing UNIX commands in a command prompt is actually useful; Hacknet is one of those games. Yes, there's a SimCity reference in the game (if you look closely enough) along with references to other games too (such as XCOM: Enemy Unknown). You'll eventually have a lot of tools at your disposal including decryption tools, memory dump tools, SSL tunnelling tools and signal scrambles; you'll have to figure out which ones are most appropriate when you're hacking into a computer. You also have to figure out how to get around firewalls and proxy servers too. If you finish the game and end up wanting to play MOAR Hacknet, you can download "extensions" (player-created content) through the Steam Workshop. If you're particularly ambitious, you could even develop your own scenarios to share! If you own the Steam version of the game, there are 11 Steam Achievements to earn and 5 Steam Trading cards to collect. It's possible to get completely stuck (e.g. deleting connection logs that revealed the IP address you're meant to connect to next or losing an admin password you're meant to use later on). I also required hints a couple of times where it seemed I was at a dead end, but wasn't really (e.g. using the MemDumpGenerator.exe on a PC that appeared to have no useful data on it). The "netmap" which visually shows all the nodes you are able to hack into gets busy real quick and the tool tips end up stacking on top of each other. It becomes difficult to click on the correct node as a result. Thankfully, with the expansion Labyrinths you're able to finally download a netmap organiser executable, although I think it should be made available in the base game and much earlier. 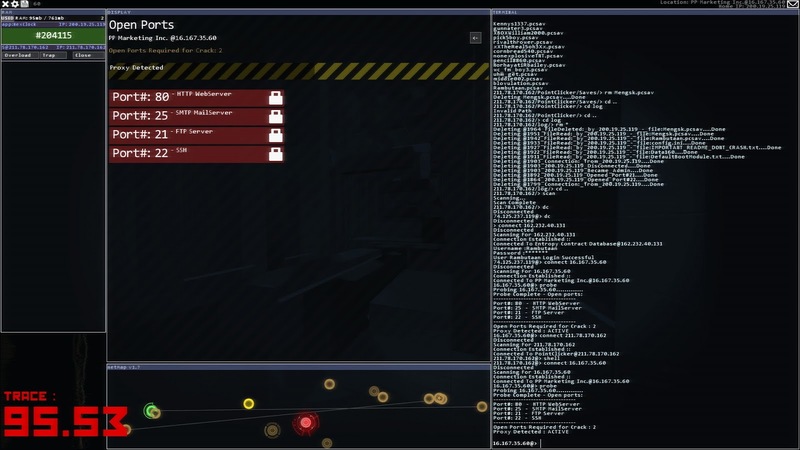 If you're in the market for an immersive hacking simulator that is as authentic as you can get without actually hacking computers for real, Hacknet is the game for you. The game also has a convincing world, a fantastic soundtrack and ethical dilemmas galore, so it's not just a great hacking simulator, it's an entertaining adventure game too. There's not really much to fault about this game except that's it not very forgiving if you happened to inadvertently delete a required file – but hey, you wanted an immersive experience, right? Is the game worth $15.29 AUD? : Yes, but mind you, this is the GOG price. The Steam price is $15.28 USD which is more like $21 AUD. Still pretty good value considering you get over 12 hours of quality gameplay with both the original game and its expansion.